In carpentry, the first key to a good joint is proper clamping. The clamp is responsible for pulling together the pieces to be glued, and for holding them tight and flush until the glue sets. No workshop should be without them. C-clamps are screwed tight, named for their shape, and they’re especially good in tight spaces. They come in aluminum, iron or steel and are designed to clamp metalwork, so if you use them on wood projects, you need to use pads. 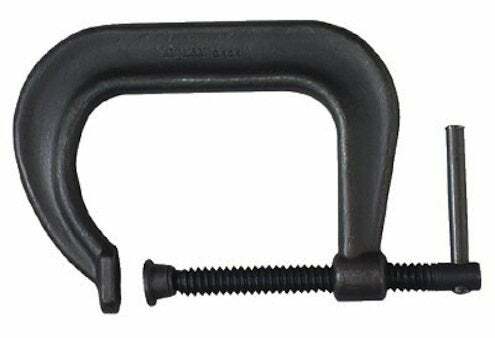 Bar clamps and pipe clamps for bigger jobs: two jaws at either end of a bar or pipe are tightened with a screwdriver. Bar and pipe clamps are strong enough for framing and door repairs. You might also want some old-school wooden hand-screw clamps for nice, even pressure over long pieces. A strap clamp can also exert pressure like a belt around an entire piece. And don’t forget spring clamps for those jobs where you could really use an extra pair of hands.